God’s power reveals he is the Lord! They are calling it the “Marie Kondo” effect. Donation centers around the country are filling up after people watch the professional organizer, Marie Kondo, lead people through her method of organizing. On her series, “Tidying Up,” Kondo uses the KonMari organization method. It begins with asking clients to gather together all of their belongings, one category at a time. Then, they are only to keep the things that “spark joy.” Finally, they choose a place for everything they keep. The show highlights the power people’s possessions have over them, making it something that the little hoarder living in each of us can relate to. In our Old Testament reading from Exodus 7, Pharaoh would not give up his possession of God’s people when Moses asked him to because he didn’t recognize God as the Lord. Each of us has something in our lives that threatens to turn us from recognizing God as the Lord, but there is something greater than anything that threatens us. We possess “lasting joy” in our Savior Jesus and we will see that through Moses’ face off against Pharaoh as God’s power reveals he is the Lord. Pharaoh didn’t recognize God’s power and authority, plus he liked having a free labor force, so he didn’t listen to God’s request through Moses. Moses described Pharaoh’s heart as hard and the only thing that would break it was the power of God. Pharaoh’s heart was already hard against God and Moses after the first time Moses and Aaron asked him to let Israel go. The first time they came to ask for Israel’s release, God gave them a sign to perform for Pharaoh to prove God was with them. Aaron threw down his staff and it turned to a snake, but the Egyptian magicians were able to do the same with their satanic arts. When their first attempt failed, the eighty-year-old Moses and eighty-three-year-old Aaron came back to Pharaoh a second time. 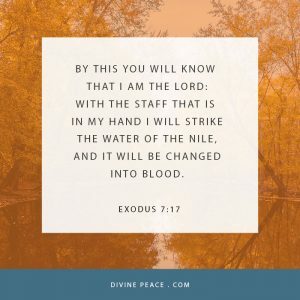 This time, God struck at the heart of Pharaoh through Aaron’s same staff by turning the Nile River to blood. God instructed them to go to Pharaoh in the morning while he walked along the Nile, so that God could show his power over Egypts most valuable resource and one of Pharaoh’s most venerated gods, Hapi, god of the Nile. When Pharaoh again refused to let Israel go, God turned the Nile and all the waters in Egypt to blood. Pharaoh’s magicians were able to turn a small bit of water to blood and copy the next plague of frogs, but God kept them from copying the next eight plagues that came from Moses and Aaron’s persistent visits. God displayed awesome power before the eyes of Pharaoh, but he would not listen. You and I face the same temptation as Pharaoh to ignore God’s power in our own lives. I won’t comment on the obvious displays of God’s power in our lives that we often take for granted. Take the the fact that we live on a large ball of dirt and water spinning at the right speed, right angle and right distance from a huge ball of constant fire and explosions that make rednecks and rocket scientists equally excited. Or the fact that God made the earth, sun and everything in six days. I won’t comment on the power of God at work to make those work. I’ll bring it down to a more tangible level. How many of us can go home and open our dresser drawers to find a wide range of Kendra Scott earrings or Apple, Rolex and Fitbit watches? Have you considered it was God who allows you to work and buy those things? Have you thanked him for those items? When God has placed something amazing in your life like a good job, health and wealth, has your first thought always been to give thanks to God? How often do you think about using all God has given you to give back to him or to give to those in need around you? Now, God doesn’t say that having a nice pair of earrings or nice watch is sinful or that you need to give up all you own and save money by digging up your own water in your back yard and catching frogs to eat along the banks of Ray Hubbard, even though that does sound like fun for some of us. When Pharaoh hardened his heart against God, he did not recognize God’s power or his authority as the Lord of all things. God gave him ten chances to turn from his wicked ways, but he wouldn’t. Finally, after God revealed his power over all the bountiful resources of Egypt, over all the false gods, after sending plagues only against Egypt and sparing the Israelites, God finally removed the Pharaoh’s legacy. The final plague God sent took the lives of all the first-born males, both human and cattle. This plague broke Pharaoh. The Egyptian idea of the Pharaoh as a god and the tradition of dynasties were stopped by God, and Israel was free. We face challenges in our lives to give God the glory he deserves for his power as the Lord of all. God’s power is so obvious around us, but it is challenged by the latest scientific theory about the universe, identity or the purpose of humanity. In reality, science should be one of the champions of God because it reveals God’s power constantly working to hold all things together. Even our language and phrases rob us recognizing God’s power. For so long many attributed what happens in our lives to ‘fate,’ but now phrases like “the universe pushed us together,” give the credit to creation rather than the Creator. The true danger we face not recognizing God’s power as the Lord is to face his judgement. All the things we do every day are not up for the scrutiny of our peers at work and school or among family and friends. God holds all the power, and we are accountable to him. This means that every time someone judges, bullies, critiques, looks down on you or fills you with guilt because you don’t meet their standards, they are wrong. God alone holds all the power and his opinion matters. When we give up believing in God’s power as the Lord to listen to the false powers of this world, they will leave us hurt and hopeless. Also, if we do not recognize God as the Lord when we die, then he will throw us out of his presence like the many bags of clothes, books and shoes from the “Marie Kondo” effect, rather than being keep us as his possession that brings him joy. There is no power in this world that can stand against the power of God. His true power is his love for us in Christ, which has saved us and given us eternal life. Jesus used his power in this world to do something as simple as replacing water with wine, something that would take us more power and technology than we will probably ever know. Yet, that was small in comparison to Jesus’ powerful work as our Savior from sin and death. In this world, not everyone will share your faith in Jesus or recognize God’s power, so when someone in your life goes on a power trip and tries to keep you as their possession to belittle and guilt trip because your house, car, kids or life doesn’t match up to their standards, tell them what your home in heaven is going to look like, who built it for you and how he has one there for them too. The world threatens to keep our eyes off of God’s power and focused on our own power or possessions, but God is the one with true power and he has made us his possession through our Savior Jesus. May God be with us to give us lasting joy throughout this Epiphany season and forever as God’s power reveals he is the Lord. Amen.